Make your own coat rack with Porta timber dowels. Watch how easy it is to make a coat rack out of timber dowels! This gorgeous coat rack can be painted, stained, varnished, or left natural to complement your personal style and interior design. You can also adjust the height and width to suit you. 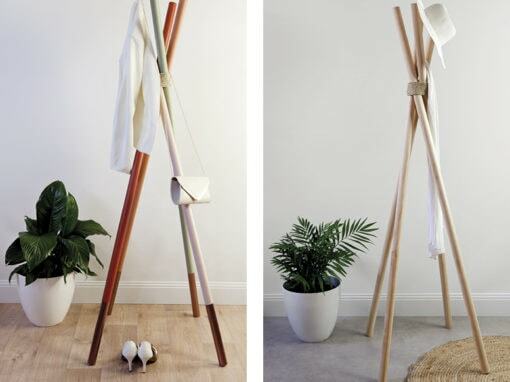 This Porta coat rack is 1.8m tall and is made with 40mm dowels. Change the height of the coat rack to make it shorter or taller, and change the width of the dowel, if you prefer. This coat rack can be easily made within a day (without painting, staining or varnishing). The Porta timber dowels featured in this project are available from all major timber and hardware stores. Find your nearest stockist. To make your own timber dowel coat rack, view the specifications and step-by-step instructions in the project sheet below.